And the autumn moon is bright." So goes the cautionary rhyme that threads its way through this classic Universal horror, starring Lon Chaney Jr as Larry Talbot, a “Welshman” (snigger) who returns to the family pile after 18 years away in America only to find himself bitten by a wolf while taking a moonlit stroll with a date. Talbot slays the beast with a silver-topped cane but is shocked when a dead man is found at the scene instead of the animal. Larry is suspected of murder by the suspicious townsfolk and begins to question his own sanity. Seeking an explanation for this mysterious turn of events from local gypsies, Larry learns that he himself has been cursed with lycanthropy and will soon become a slavering monster with an overwhelming compulsion to kill. You’ve got to hate it when that happens. Chaney brings a great deal of warmth and sympathy to the lead but the real star here is Claude Rains, who anchors the film with his trademark urbanity and plays things commendably straight, even though the very idea of this vertically challenged thesp being the father of the hulking, barrel-chested Chaney is laughable. The finale, in which he beats the monster to death only to realise it was his own son all along, inspires a moment of well earned tragic pathos that only an actor of Rains's skill could carry off. Bela Lugosi is also a welcome presence, appearing under his own name in an important cameo as a fortune-teller. Russian Maria Ouspenskaya, a noted acting teacher, is splendid too as Lugosi’s gypsy widow, as authentically sinister as Lorna Raver was in a similar part in Sam Raimi’s more recent horror, Drag Me To Hell (2009). 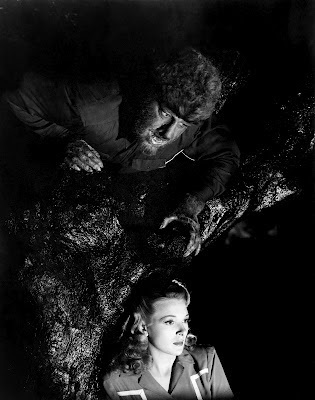 Evelyn Ankers and Ralph Bellamy provide game support (“Make a note of that Twiddle!”) and director George Waggner clearly did the best he could with meagre resources, certainly getting his money’s worth from the fog machine but perhaps failing to properly establish a sense of place. The script by Curt Siodmak, who would go on to write the excellent sci-fi Donovan’s Brain (1953), is ultimately a little sparse, however, and leaves a number of obvious questions unanswered. Why, for instance, does Talbot become a hairy humanoid wolf man when Bela simply metamorphosed into a regular canis lupus? Why isn’t Gwen more alarmed by his unapologetically voyeuristic habit of spying on her through his father’s telescope? Isn’t it more than a little convenient that her antique store should happen to be selling wolf’s head-and-pentagram walking sticks made from solid silver? And why hasn’t the proprietor of the local shoe shop noticed the number of shifty, haggard-looking men skulking in bloodied and barefoot to buy replacement footwear at all hours of the morning with no questions asked? Of course, these sorts of gaffs and gaps only add to the charm and would hardly have interested contemporary audiences genuinely startled and enthralled by the effects. 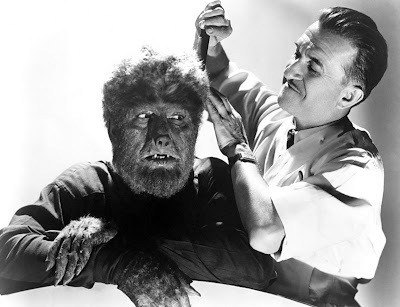 Preceded by Werewolf Of London (1935) starring Henry Hull and inevitably remade with Benicio Del Toro, Anthony Hopkins and Emily Blunt in 2010, Chaney’s Wolf Man is a vintage piece of silliness, undoubtedly creaky but a pleasure nonetheless and still iconic thanks to Jack Pierce’s inspired make-up. Films like An American Werewolf In London (1981) and the advent of CGI may have caused Pierce's handmade transformation effects to be overtaken and surpassed, but his craftsmanship and innovation are there for all to see. Above is a great shot of the maestro preparing Chaney for the first of four cross-over films the Wolf Man would be resurrected for, Frankenstein Meets The Wolf Man, in 1943.